Here is card two from the Open House yesterday. 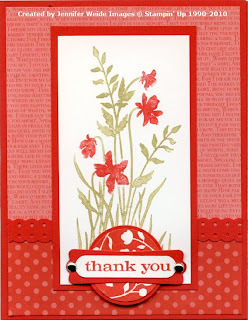 When I saw this card by fellow Demo Marie a few weeks back, I knew it would be a great card for my Open House. I changed it up slightly and here is the version we made, well one anyway. There are two versions of the DSP, and I didn't scan the second. Maybe I'll add it later. Card base is Poppy Parade. Background is one of the prints from the DSP pack: the word print is one side of the paper, the dots are the reverse side. I cut it layer size for the background, then cut the bottom and reversed it. We cut a strip of Poppy with the Dotted Scallop Ribbon border and attached over the seam. The main image was stamped after coloring the stamp with markers, Pear Pizzazz for the stems, Poppy Parade for the flowers. It is layered onto Poppy and attached to the card front. Next, we did some punching! The floral circled image was stamped in Poppy Parade on Whisper White and punched with the 1-1/4" Circle punch and then layered onto a Poppy Parade 1-3/8" Circle. The saying (one of the 3 from the set, all work) was stamped in Poppy and punched with the Word Window punch before layering onto a Poppy Parade Modern Label. We added brads to the tab of the label. The Modern Label is attached to the circles with snail, the the circle is attached the card front with dimensionals. Great card and think of all the colors you could do this in that would be just as pretty! Thanks again Marie for this GREAT idea!! Click HERE to shop my Online Store Anytime! Just click the Shop Now button top right!! This is a great card -- the color is a fresh touch for this stamp. Love the TY medallion. Lovely card ... I can see why you would want to CASE it!! So pretty!!! I love how it is "almost" monochromatic! Very purty. Love the color!